I’ve just returned from a fabulous vacation in Greece. While on Mykonos, I sampled a couple of salads that were delicious and refreshing. Our guide outlined the ingredients list, and I’ve tinkered with the recipes. I think these are close approximations of what I ate on the island. They're both really easy to make. Enjoy! I find fish roe in the dairy case at my supermarket. Soak the bread in warm water for about half an hour. Drain and squeeze out excess water. Boil the potatoes, peel, and lightly break up the pulp with a fork. Mix the fish roe and lemon juice and carefully separate the eggs from one another. Taste and adjust seasonings. You may wish to add more lemon juice or dill. Serve with bits of toast. 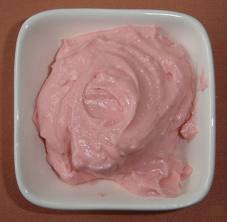 Greek yogurt, made from sheep’s milk, is creamier and lower in calories that other yogurt. A suppler around the corner from where I live keeps it in stock, so I use it most of the time. If you are unable to find it, buy a plain (unsweetened) yogurt. 1. Combine all the ingredients except the salt and pepper. I love Tzatziki. First had it at Greek restaurants in Germany. It's very similar to an Iranian dip called mast o khiar, which is flavored with mint instead of dill. I first encountered the mint version from an Iranian American student intern at my job many years ago.